President Cyril Ramaphosa’s waning star flickered just a little bit more brightly after his announcement of a much-vaunted stimulus package to offset the serious decline in the recent performance of the South African economy. To be sure, any announcement about spending re-allocations and budget reprioritisation from government is likely to be met with a sceptical response. Money has never really been the problem in terms of the broader South African budget – rather it has been effective use thereof as state-owned-enterprises, moribund ideological policy initiatives and gross misconduct has sapped tens of millions out of efficient state delivery. With a new drive to find R50bn and another R400bn of new ‘blended’ investment sources, the same old question marks remain. Is government ready to spend wisely on projects that represent important policy shifts away from narrow party or patronage-based interests? Does government have the expert capacity to direct its attention to projects that position South Africa for the future and therefore require very specific technical skills? Can the ANC bury some if its ideological factionalism (and idealism) in pursuit of best-practice policy development? Will this new tranche of remedial attention be any different to the host of state turn-around strategies that have largely thrown good money (and lots of it) at bad state enterprise development? Putting aside these somewhat tough questions – and to his credit – the optics from the President’s announcement were better than we had seen in the recent past. His first six months had largely ignored a call for joint action with the private sector and had largely failed to provide an enabling environment in which this vital rapprochement should occur. Last week though, this changed. Perhaps it was the dire state of the economy but perhaps it was also the unchartered waters of domestic ANC politics that prompted a more business-friendly approach from the President. Finding common ground with the private sector is now back on the front-burner with the proposed business summit now slated for October. Amidst all of this, though, was a very important announcement buried within the larger stimulus rhetoric. 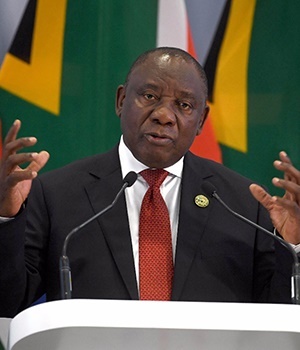 Ramaphosa announced the appointment of a high-level land reform advisory panel to assist in the ongoing land-reform debate. More than anything else, this announcement was the boldest part of the President’s interventions. The new advisory panel is strong from both an academic and a farming base. It’s members have well-publicised views on the land debate – many of which have spoken out against the necessity for a constitutional amendment. Including those from organised agriculture further adds to the well-rounded team assembled. But this panel represents an important political risk for President Ramaphosa. While South Africans have been expressing themselves in both public and parliamentary hearings, Ramaphosa has now added an eminent group of experts into the mix. He has broadened the scope of advice outside of his own political party and outside of the emotive public debates on the issue. This is indeed a sane approach but one that can clash with the populists both within the ANC and outside in the EFF and elsewhere. Importantly, shifting gear to greater consultations with the private sector, academic and business experts is critically important in shifting the narrative towards the ‘social compact’ Ramaphosa spoke about way back in February. Obsessed with his left-wing flank and the EFF, it would seem that some restoration of a more balanced approach to problem-solving is once again coming to the fore. Of course, we are moving closer to an election. And Ramaphosa can play as good a political game as anyone. Utilising his office as President and the levels of government, the stimulus package can be seen as an attempt to show the ANC is serious about addressing the economic shortcomings of the nation. Despite denials to the contrary, any political party anywhere, will attempt to use their incumbent position to offset a deteriorating status quo. Still, both the partial re-embrace of the private sector and the broadening of the land debate issue tell us something else. And, it’s linked to the ANC’s recent electoral fortunes that have been less-than-stellar even under the new Ramaphosa brand. Ramaphosa’s somewhat uncomfortable and even messy ‘flirtation’ with populism on the land issue has failed to win the ANC votes in recent by-elections. The expert psephologist Dawie Scholtz points towards a further 5% decline in ANC by-election results this year and the just released Institute for Race Relations reports confirm this lacklustre polling figures for the governing party nationally and in particular, in Gauteng. Despite trying to outpopulist the EFF, Ramaphosa has not been able to win back many from that side of the political fence. Similarly, his weak management of the economy and confused rhetoric on land has served to shore up the DA’s support that was severely under pressure a few months back. A remaining political strategy for Ramaphosa is to re-engage the private sector and broader business interests – to sweet talk them into coalescing in one way or another in advance of the 2019 election campaign. Business are always keen to embrace a government that talks their language and given the broader political dynamics at play, Ramaphosa may well feel that the sector is becoming more important to his own political survival than attempting to out-play the EFF. In addition, with the ‘fight-back’ from the pro-Jacob Zuma camp and broader fallout from an increasingly embarrassing and damaging Zondo Commission of Inquiry, embracing the business sector also provided Ramaphosa with a sense of security. After all, he might well need the goodwill and largesse of the business community to assist keeping him in power – or at least – strengthening his hand. Ramaphosa is therefore being forced to choose which side he prefers. And it’s a very tough choice. The ANC remains deeply confused on its economic policy direction - witness just the 24-hour period in which two radically conflicting statements on the independence of the South African Reserve Bank played havoc with policy certainty. In itself, that epitomises the two world views around state intervention and control versus independence and broader de-regulation within the economy. Perhaps the President has attempted to play all sides in his first 6 months – but in that, he didn’t really satisfy either. Political parties always try to find middle-ground and massage the extremes on either side of policy debates into submission and acceptance. But he now has to choose an angle. His 6-month trial has not worked in reeling in the votes and a more market-friendly approach is more likely to win him friends. So, while the stimulus package is likely to be more of a public relations exercise in the short-term, it’s the longer more strategic decisions that really count for the Ramaphosa faction. Whether he can begin divesting the ANC of the SOE disasters remains to be seen. Can he preside over job losses in the civil service? Can he avoid a damaging constitutional amendment on land? These will be the real crucial issues on whether South Africa will sink or swim rather than the R400bn stimulus just announced.